Ski poles are used to help push you along on flat areas, and for pole planting in intermediate and advanced skiing. 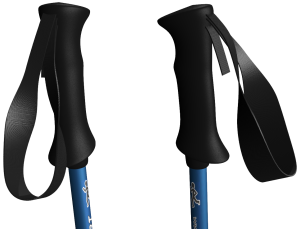 There are all sorts of ski poles that you can buy, they can be intended for different types of skiing or made from different materials. Whichever type of ski pole you have however, the most important thing is that it's the right length. A ski pole's length is normally measured in cm from the top of the grip to the end of the tip. The length poles are available in, vary in 5cm increments. 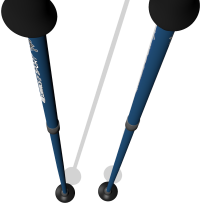 The length of a ski pole needs to be matched to the height of the person using them, and to the type and standard of skiing they will use them for. When in a shop trying to work out what length of pole you want, you must remember that ski boots will raise your feet off of the ground a bit more than normal shoes, and that when you put your skis on they will raise you up about another 4cm further. Another thing to take into account is that generally the tip of the ski pole will sink into the snow as far as the basket at the bottom. One common way of estimating if a ski pole is the right size, is to hold the pole upside down with the grip on the floor and the top of your hand touching the basket, this gives you a better idea of how long the pole will seem when you use it. Below is a standard guide to the rough length of pole you will want for your height. To work out exactly how long you want your ski poles to be can only be done by testing poles on the slopes. As you get better at skiing you will generally find that you want slightly shorter poles, as you will start to use a more aggresive stance with your knees more bent. If in doubt about how long you want your poles to be, it's generally better to go longer, as poles can be cut down and made shorter if needed, but cannot be lengthened. Below is a guide to the different parts of a ski pole, with details on how each part can vary. 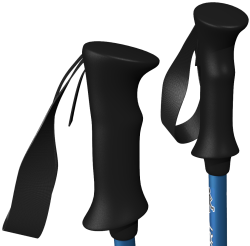 The grip is the part of the ski pole that you hold on to, and is normally made from a slightly rubbery plastic. Different manufacturers and models of pole will have different shapes of grip, so it is always nice to find a pole with a shape of grip that you find comfortable to hold. On many poles the grip will be wider at the top and bottom, to keep your hand in position on the pole better, although this is not always the case. Poles that are intended for touring skiing might have an extra length of grip, underneath the normal part. This is so that the pole can be held lower down when traversing across steep slopes. Poles for slalom racing have a guard in front of the grip to protect the riders fingers, as slalom racers punch the gates as they ski round them. The strap goes around your hand and wrist as you hold the pole. The strap enables you to push harder on the pole without needing to hold the pole as tight, and also stops the pole falling to the ground if you let go of it. The the length of the straps can be adjusted to fit your hand size and glove thickness. On some straps the adjustment is done by a buckle on the strap, and on others the adjustment mechanism is inside the grip of the pole. Some straps will also have padding on them, to make them a bit more comfortable. One manufacturer does away with the traditional strap, by putting a hook and clip on the back of the grip at the top. Then by using either special gloves or a special strap over your gloves, you can clip a small loop over the hook, and be connected to the pole by the loop. This system makes it a lot quicker to put on and take off the straps on your poles, although it doesn't let the poles hang from your wrists if you want to use your hands for something else. The shaft is the main length of the pole, and is normally made from either aluminium or carbon fibre. Aluminium poles are generally a bit more robust than carbon fibre poles as in a hard impact they will normally bend or dent instead of snap or shatter, and can often be bent back into shape. If an aluminium pole has had too many impacts though it can end up not being very straight any more. Carbon fibre poles however will bend and come back to their original shape, although if they are bent too much they will snap and cannot be repaired. 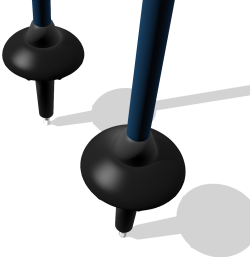 Some poles can have their length adjusted, through an adjustment mechanism on the shaft, like the Mechanics of Sport poles. This type of pole is often intended for touring skiing, so that the pole's length can be changed for hiking up and skiing down, although poles for normal skiing can also have this feature. This can be good if the poles will be used by different people, if you like to change the pole length for different types of skiing, or if different pairs of skis lift you off the snow by different amounts, and you want to compensate for this in your ski pole length. The poles with all the weird shapes are generally meant for racing. These shapes help the poles go around the body while the skier holds their hands out in front in an aerodynamic stance. Generally the more extreme the shape changes in the poles are, the more they are intended for super-g or downhill, where the aerodynamic positions are held more often and for longer. The tip of a ski pole is the part that sticks into the snow. The tips are sharp / small enough that they will dig into the snow easily, without being so sharp that they are dangerous. 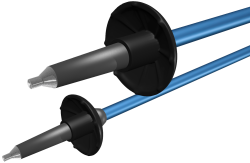 Ski pole tips on cheaper poles are normally part of the shaft with a metal cap on the bottom. On more expensive poles the tips are often replaceable, and will snap off if they are hit by a ski. These tips are a separate extension on the bottom of the shaft and are generally made of plastic with a metal tip. The basket is the disc like object towards the bottom of a pole just above the tip, and is there to stop the ski pole from sinking too far into the snow. Baskets on ski poles can come in many different shapes and sizes, and some poles come with more than one set of baskets. On many poles the baskets can be removed and changed by screwing them on and off, although often on cheaper poles the baskets can only be replaced if they are broken. A standard basket is in the region of 5cm across (2") and is intended for general piste or allround skiing. Very small baskets are normally intended for racing as they have less air resistance, and larger baskets about 10cm across (4") or more are intended to be used in powder. In powder a larger basket's area makes it push down on more snow so that the pole won't sink as deep into the soft snow, which increases the support the pole can give. Although most people will use poles that roughly match the chart above, freestyle skiers often use very short poles as they carry them as much for show as for function. They need the poles to be short so that they won't get in the way of the skis when doing spins or tricks. Move on to the Ski Goggles section.